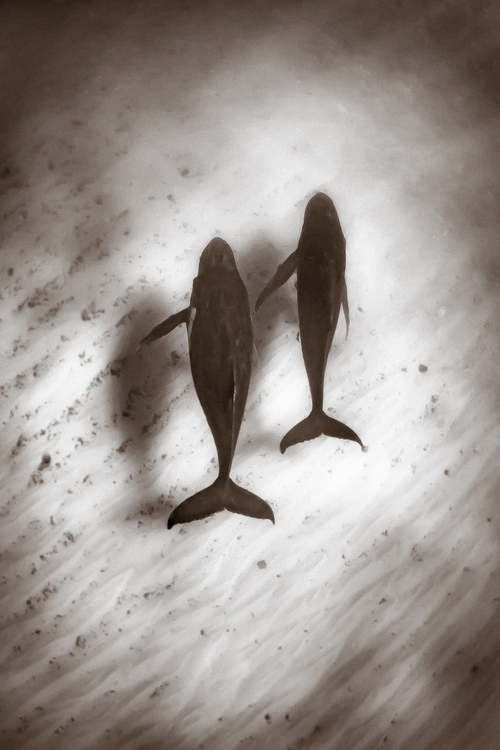 Twenty metres below us the pair just hung there on the bottom, motionless, a strange stillness in an ever moving ocean. A silhouette against the white sand, too far down to make out their detail, not so deep as to be hidden from our gaze. Almost as if they wanted our attention. It was their interactions that opened my mind and my heart to these beautiful creatures. Here in this quiet moment the sense of shared stillness, of being together in that moment was overwhelming. Like being with a best friend, not talking, each in our own thoughts, reading or drawing or perhaps engaged in some other quiet activity yet with a pervading unspoken underpinning oneness. In these humpback whales, off the island of Fofoa, Vava'u I felt a kinship, a sense of equals and perhaps even the respect of a cherished mentor. I am so grateful for my time here with these beautiful beings and their gentle reminder to cherish togetherness.